How many of you have been researching your family lines only to be stopped dead in your tracks because of the language barrier? I have found a new website that is available for those researching their Russian heritage which provides assistance with translation services of older documents. The Russian Translation and Interpreter Language Services Website provides a wonderful service for those of us researching our Russian ancestry. I have been conversing with the owner of this company Antonina who is a native Russian speaker. Antonina provides many translation services including letters, medical records, court interpretation, and genealogical records. The fees for this service are reasonable and can be found at the website. The turn around time for the translation services depends upon the complexity of the document being translated but generally it is completed within a 24 hour period. A letter translation turn around is guaranteed to be completed within 3 hours. You can email a scanned image of the document for the translation services directly to Antonina or she will also do a phone consultation as well. I feel that it would be best to send a scanned image of the document for the translation. The website design is user friendly providing links for the typical rates charged, interpretive services, translation services. The site states that they accept several different forms of payment including PayPal and most major credit cards. However when I clicked on the payment option, I was taken to a PayPal option only. The option for credit card payment is not clear as I have not been able to locate this payment option. Antonina, if you read this post, would you please post a comment regarding the credit card option. I would suggest contacting the Russian Translation and Interpreter Services for a free estimate of the translation services you need whether it be a vital record document, will or letter. Antonina is kind and helpful and would be happy to answer your inquiries. 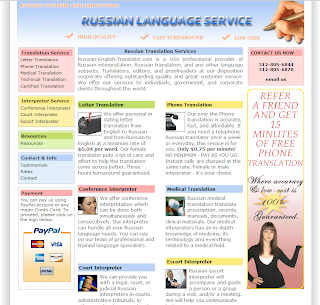 Russian Translation and Interpreter Services. To view the cost for the services, you need only to click on the rates tab on the left side of the website and there you will find the rates for various documents. If you have questions regarding your specific document, you can contact them directly by telephone or by email and they will respond quickly. Have Fun!! Regarding a payment option, if you go to my Payment for Russian translation page, you will see a paypal logo in the middle of the page. It will take you to a shopping cart. After inserting a desired sum you will be able to check out. And on the next page you will see two options: 1. "Use your credit card or bank account" and 2. "LOG IN TO PAYPAL." So from there you will be able to choose whatever method you prefer. I hope this sounds clear to your blog readers. Thank you for clarifying the payment options. I know that everyone appreciates the instructions. I think the instructions are clear. If they have further questions, they can contact you directly through your website. hi..thanks for letting me into your space. I love your blog. And got a tip or two. Thanks!! I am glad that you are enjoying my blog. I hope that what you have been finding will help you in your search for your ancestors. Good Luck! Indeed, this site is the best one for Russian translations.